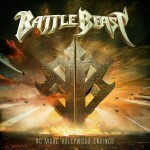 Share the post "Album review: BATTLE BEAST – No More Hollywood Endings"
Battle Beast are back with their second album since founding member, guitarist and chief songwriter Anton Kabanen left in 2016 to form Beast In Black (who released their latest album earlier this year on the same label). For those expecting a heavy dose of battle metal based on the band’s name think again, as Battle Beast mix metal backing with a keen ear for 80’s AOR/melodic rock. The album’s opening song ‘Unbroken’ sums up the band’s sound perfectly being a heady mix of metal riffs and rhythm mixed into a glorious melodic rock fuelled chorus and melody. The synth drums on ‘The Hero’ give the song a real 80’s soundtrack feel, if they remade ‘Top Gun’ this song would be on the soundtrack. Then we have ‘Unfairy Tales’ with its dance beat backed by plenty of riffing guitars. Those after a bit of metal heft look no further than ‘Piece Of Me’ – like P!nk going metal and a very catchy tune. They even pomp it up on the intro of ‘Raise Your Fists’, a neat little forray into power metal territory. Touch of the 80’s power ballad beloved by bands like Heart on ‘Endless Summer’, which like all the songs on the album highlights the powerful and melodic vocals of Noora Louhimo. Not for her the wailing harpy sound you get with some female fronted bands, rather Noora has a rich, melodic vocal that easily hits the high notes and can fill any song with passion. This entry was posted in ALBUM REVIEWS, ALBUM REVIEWS (Mobile), All Posts and tagged album, AOR, Battle Beast, melodic, melodic metal, No More Hollywood Endings, Nuclear Blast, pop metal, power metal, review. Bookmark the permalink.